Guys, look! I have proof that I actually have been doing some sewing this summer :) If you follow me on Instagram, then you have seen some progress shots of this quilt over the past couple of months. I purchased this as a W.I.P. from my online quilty friend Krista over 3 ½ years ago! The pattern is Single Girl by Denyse Schmidt. Krista had a number of blocks done and almost all of the templates cut out for the rest of the blocks, but realized that she didn’t have the time to finish it. I LOVE the Modern Meadow line by Joel Dewberry and her mix of it with the charcoal gray seemed a perfect fit. I just had to have it…besides a lot of the hard work was done, so in my view it was a great deal. When she sent it to me, I was busy on another project, so I tucked it away and that is where it has sat until this summer. Here is the only photo I have of the full quilt (because you need two people to hold it up!). This was taken just after I finished the piecing. Isn’t it cool? 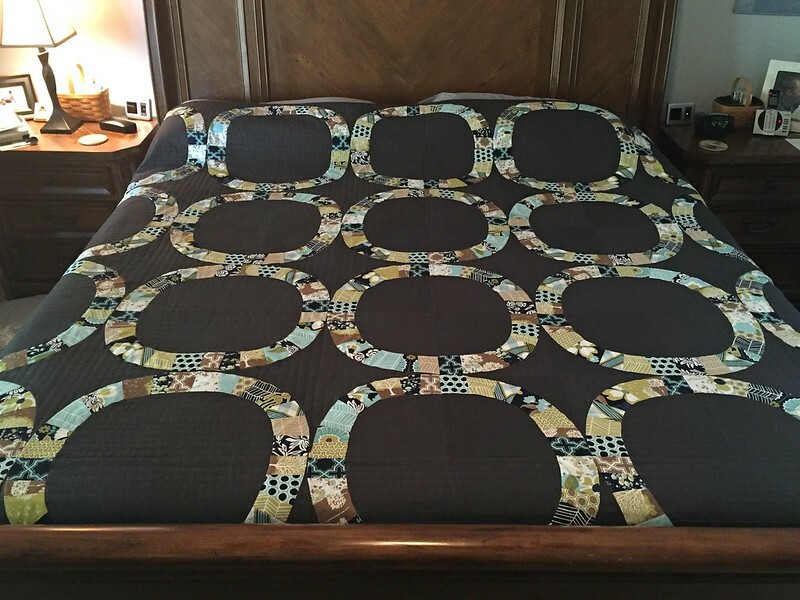 I was debating sending it out for some awesome custom quilting, but decided to save my money and quilt it myself instead. My plan was to do straight horizontal lines across the entire quilt. 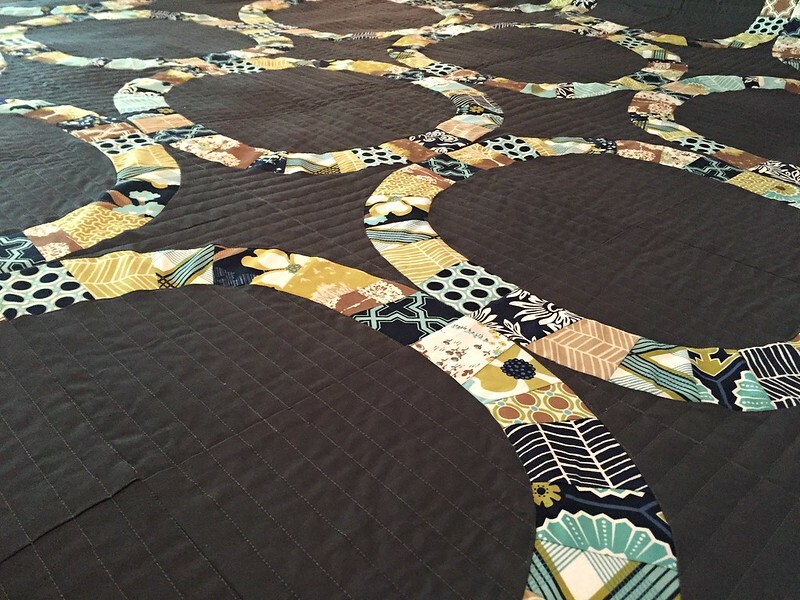 When I started quilting it, I had issues where the circles met and the seams were so thick. My machine just didn’t want to go over them. So, I changed to Plan B and avoided those seams altogether! 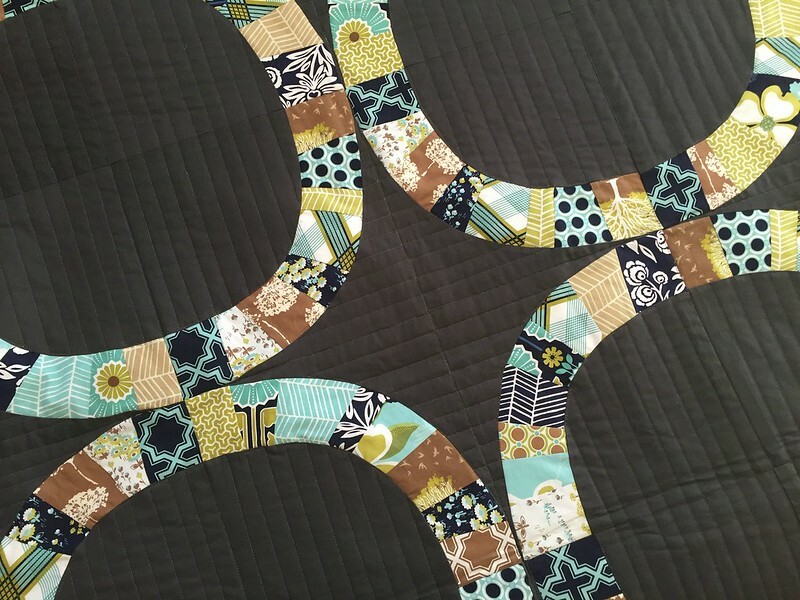 I quilted horizontal lines every ¾” inside each circle and vertical lines in the “diamond” shapes created between the circles, leaving the pieced circles themselves unquilted. 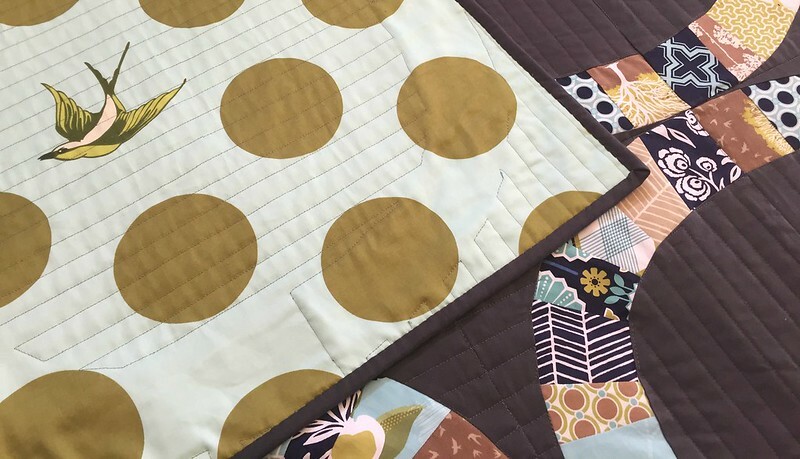 I love the texture of the straight lines and am hopeful that after it is washed and dried, I won’t regret leaving the circles without quilting. But honestly, it’s done and that is more important to me! 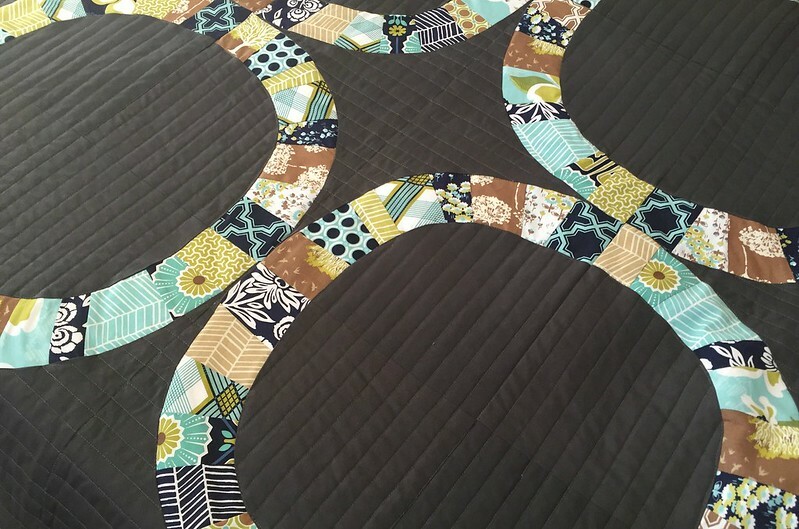 Once it was quilted, I had to figure out what fabric was used as the background (remember I purchased this forever ago) and buy more of it online for the binding. It arrived last week, I finished hand sewing it down last night and am ready to snuggle under it tonight while I sleep. 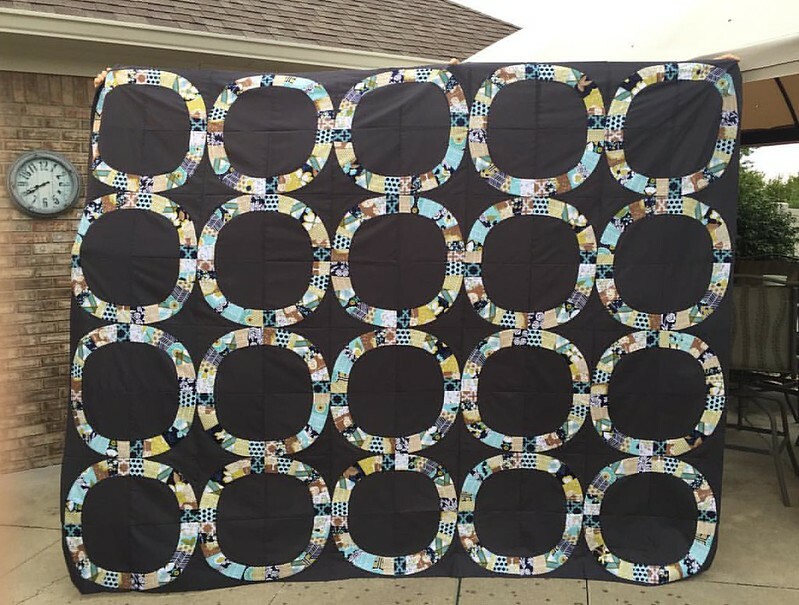 I have always admired the Single Girl quilts I’ve seen online thinking one day I would make one. Thanks to Krista, I finally have a beautiful version for my own bed. I probably never would have made one (not king sized at least) if she wasn’t selling her W.I.P., and I am so thankful that she did. Here it is on our bed. Now I need to make (or maybe just buy) some cool shams to go with it.